The invincible bucket is ideal for carrying bricks, mixing, plastering, plumbing, landscape gardening, fishing, mechanics etc and it eliminates general breaks that normally occur from excessive use. This invincible bucket can hold up to 3 gallons/ 15 litres of fluid. Handy internal markings are etched on the inside of the bucket in gallons and litres to make measuring as accurate as possible. Incorporating a strong metal handle with a black plastic handhold to make carrying easier and more comfortable, it also has a useful pouring lip designed to prevent any unwanted spilling. 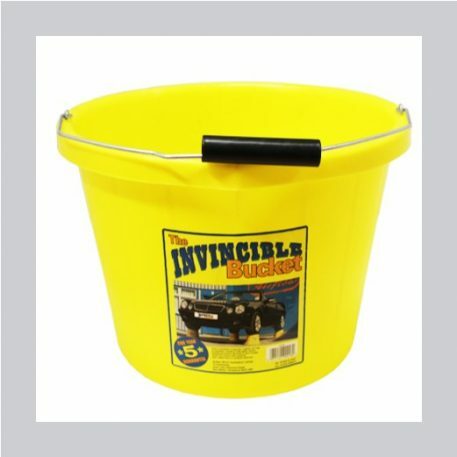 You will receive one yellow 3 gallon / 15 litre Invincible feeding bucket.